You and I know that there’s a TON of money to be made in the offline niche. 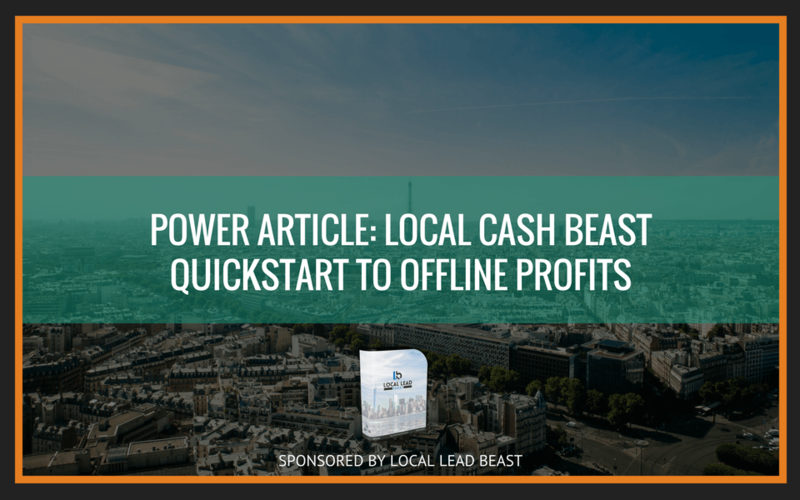 That’s one of the reasons why we launched Local Lead Beast. But my bigger personal reason is, I know how beneficial it is to have “extra money” coming in to pay my way to growing my business. Earning an extra 100 dollars means my autoresponder, host, and domain are paid. And for those who are just starting out online, this means you don’t have to touch your “real world salary” for the courses and services you buy in order to build your business. So, as a service to our valued customers, I’d like to share a cool “no-fail” way to earning money offline, even if you’re a total newbie. This has been of great use to me. Now, let me do you a favor and get you straight to the action. First, put this in your mind: the only way to get offline clients (and get them paying you up front and a monthly fee) is to have them know you exist. If they don't know who you are AND don't know that you can help their business, there is absolutely ZERO chance they’ll ever cut you a check. Correct? Now, there are a ton of ways to get in front of business owners. Networking. This can be a great way to get in front of the business owners in your local area. It requires you to go out and actually talk to people. Cold calling. Who really wants to do that? Emailing. Can-Spam compliant ways to do this are few and far between. I am sure that you can add a few more to that list. I’m not going to debate the merits of any of these methods. They all work if you are willing to put the time and effort into them. Now, another method that people used to do was buy domains, get them ranked and then calling business owners. This requires both cold calling and purchasing domains that might sit in your account forever with nothing ever coming of them. The reason I listed the last method is that we are going to be doing a version of that. But this time, it won't cost you the price of a domain name. You can target city dentists, lawyers, accountants… pretty much whatever niche you want. The trick to making this work is leveraging videos and Youtube to get in front of our prospective clients. We are going to force them to notice us in a cool way. The twist I put on making sure that THEY NOTICE YOUR VIDEO is one of the most clever marketing tactics I’ve seen. It is so darn cheap I can't believe it. We need something that will cause business owners to pick up the phone and call you. For that to happen you will need some sort of web property. The video that we are going to on YouTube will be the actual video that you'll sell or rent to a prospective business owner (e.g. a "dentist" spokesperson video if you're targeting dentists). The only caveat here is that you have to make the video generic enough (the done-for-you spokesperson videos on Local Lead Beast fit the criteria) so that you can sell it to "any dentist". Don't worry, I will be providing you the script to sell this covertly later on. The thing to remember here is: you have control of what appears in the "description area, annotations, and cards" in this YouTube video. That means, all you have to do is "write about your services thru the description, annotations, and cards". You could say something like "This marketing video is for rent / sale. Want to have your Dental Clinic contact number and website link appear here? Contact us at 555-5555". Since the video will be an actual "demonstration" advertisement for your business, you will be proving to them that you can get the job done. You’ll be showing them that you can get traffic. And at the same time be right in their face with your message. I will cover how to make sure that they notice your video later on in this article. This isn't something that I have experimented with before but I want to make you aware that the option is here. ON the right hand side of the tabs on the top is a section called "Captions and Subtitles". I am wondering if you upload a file with keywords that you are targeting to this section that it will help with the on page SEO? Again, this isn't something that I have experimented with but I am just putting it out there. If you do mess around with this I would love to hear about your results. That is it for on page SEO when it comes to Youtube. You want your video to have the proper Title, Description and meta tags. Then you want to make sure that your video is Geo Targeted towards the location that you are trying to rank for. The last thing that you want to do is to make sure that you have added annotations that have the keywords that you are targeting as well as a clickable "Call to Action" annotation at the end of the video. This information can be applied to all different types of Youtube videos and not just these offline videos. Consider this a little "YouTube SEO Course". Now here is where the magic comes in. Since the video has been uploaded to YouTube and we have all the on page SEO done for the video we can get as crazy as we want when it comes to linking to the video. Normal SEO practices (which I don't really believe in) say that when you upload a new site that you need to back link to the site/page very slowly. A few links to get started and get the page indexed. Then a few more links and increase the links as you go along. This logic doesn't hold true when it comes to YouTube. YouTube gets MILLIONS of links to the site every single day. You can't blast enough links at your video to really cause it any harm. With that being said you don't need to run out and buy 1,000,000 backlinks to the video either. We are dealing with local SEO and the amount of links that we need to get will vary from city to city. A big city will require more links than some small town. Here it depends on what your level of SEO is. Do you have SeNuke, Magic Submitter, UAW, SEOLinkvine, Article Robot, XRumer, etc.? The amount of backlinks it takes to get your video #1 will depend on the city and niche that you are targeting. I can't be any more clear about that. There is no single answer that I can give you that will tell you exactly how many links you will need. You need to do the SEO until that video is ranking #1 for your city niche. In this example, SEO would continue until the video reaches #1 for "Houston Dentist/s". As you can see from the video above, the #1 result when you search for Houston Dentist has a grand total of 37 links pointing to it. That is why I suggest you start out with a reasonable number of links at first. That way you don't waste money sending thousands of links to the video when a hundred will do. Don't stop once the video reaches the first page or the video is in the top 3. You want to be #1 and that is the only thing that matters. Go all out or don't go at all. There are courses that cost $997 and up and all they do is talk about SEO. For me to get into it here would be a waste of time. If you don't have any clue on how to build links to your site I would suggest you OUTSOURCE this task. What I am telling you is that if you already have the tools in your arsenal to do the SEO work yourself then all you need to do is get on it. If you don't have the automated tools I would suggest that you spend a few $$ per video and have someone who is a professional in SEO take care of the heavy lifting. You can take care of the SEO on your own without using any of the automated tools on the market but I would suggest that if you can afford to pay someone else to do it then go that route. The sooner you get your first client the sooner you can reinvest your profits back into getting more and more clients Either be fast and spend a few $$ or you can take your time and let the money trickle in. The choice is up to you. Now here is where it gets really exciting. I know you probably think that it is going to take a long time for some business owner to notice your video and actually pick up the phone and call you. Don't worry about that because I have you covered here. This method is so simple and so CHEAP that I can't even believe that I am telling it in this article. Ok, so here is what we are going to do. Cold calling is the best way to get business owners to respond to your amazing first page results on the video that is advertising your services. I know that you don't want to do the cold calling so here is what and how we are going to do it. We are NOT going to have these people call and try to sell for us. We roll differently, coz we are cool like that! The way we are going to go about this is that these people are going to call the businesses that we want to see our video and ask them what their website address is. I will go through the whole script below that I give to people who make calls for me. The first thing that you need to do is grab the name and # of 5-20 businesses in the city and the niche that you are focusing on. You could use our Local Lead Beast software. Or, I would suggest you find those who aren't coming up on the first page of Google or Google Places or Google Maps. These are the companies that need your help the most and that is why we want our new Telemarketers to contact them. Telemarketer: I was searching for (niche) in (city) and I couldn't find your website. Whats the url I can find more information about your company. Telemarketer: Let me repeat that back to you real quick because I was searching on Google for (niche) in (city) and the first thing that kept popping up was some marketing video. I have the URL as xxxxxxx.com Is that right? GateKeeper: That is correct. Anything else I can do for you. Telemarketer: That's all. I was looking for your site on Google and couldn't find it. Thanks, I will check out your site and see what you have to offer. I want you to take a minute and reread the script that I have just put up above here. Imagine that you work for a Dentist in Houston and you got a phone call just like that. What would be the first thing that you would do? I don't know about you but the first thing I would do is pull up Google and do a search for "Houston Dentist/s" to see what they were talking about. Even if I wasn't searching for the marketing video they were talking about I would run the search to see who exactly does show up for that search term first. Once they do that they will see that the #1 result is your video that is selling your services to the company. Do you see how this is coming together? I hope so because this is some powerful information that I am putting together here. The key to this whole method is that your Telemarketer never calls the same company more than once. If you do that then they might start to get a little suspicious. I'll admit, this technique is somewhat along the "grey-hat territory". But the only reason you're doing this is to help those local business, and yourself. Technically, since you already ranked a video for "their niche" - there's already the presence of competition there. You're just alerting that the "advantage" could be theirs. The whole conversation above can be had in less than 2 minutes flat. That means that if someone is willing to make phone calls for 1 hour for you, they will easily be able to make 20 calls. Twenty of these phone calls will get your phone ringing in no time. The gatekeepers are there to make their bosses life easier. Do you think if they found the video that you just put up and they let their boss know about it that they would be doing them a favor? Not to mention the fact that they have received a phone call from a potential client that has also seen the video and couldn't find their website. It is up to you at this point to close the sale. Just because they called you doesn't mean that they are going to just hand over a check. You will still need to sell them on the idea of hiring you for their SEO and online marketing needs. One of the first things that you can sell them on to get them on board as a paying client is a marketing video for their site. If they want a customized video, you can easily create or outsource that part, and simply re-rank that new video. Of course, this would set you back in effort and investment, but this will allow you to charge more. Just make sure they pay first before you get to work on the "customized" order. Before I end, here’s a video creating resource you might like - http://studio.stupeflix.com. It has cool features and awesome templates. This simply requires you grabbing some images and adding some text that relates to the company that you are selling the video to. If you already have Local Lead Beast, then you already have done-for-you videos you can sell to local business owners (in different niches). Nothing is really stopping you from making money now. That is the easiest way to get them on as a paying client right away. The call to action at the end of the video will help them make that purchasing decision a whole lot easier. There you have it. Give me that mighty fist bump and go make money! Great Article Dex! I need a little more info. ok houston dentist in title of video and my advertisement in the video displaying services for sale. 1. Do i put the price of my service in the video? 2. Once paid for do i delete and replace video once a purchase is made or can i upload a new video over (over write) the advertisement video. 3. How much do i charge? $497 one time or $497 per month? Thank you for your time and consideration. Hi Jeff! Glad you liked the article. I re-wrote “Step One” a bit (and item  under “This works great for 2 reasons” towards the end of the article) to answer your question #2. It’s best you test putting (and not putting) the price in the annotations, or description, as different niches might act differently. Pricing would also depend on the economy of the place you are targeting, plus the niche. You can charge 1-time BIG time (e.g. $97-497), or recurring for smaller price (e.g. $9-47/mo). Wow, love it. 🙂 Thank you for the awesome article. It is a good read. The details is just what I’m looking for as a how-to guide. Awesome, Rey. Glad you loved the article 🙂 Hope you keep on visiting the blog.